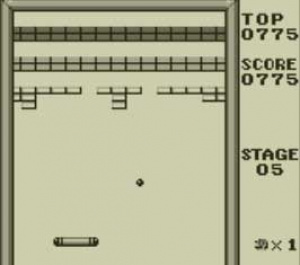 The most well-known block-breaking game, Arkanoid, became quite popular after its release in arcades in 1986. Many companies have created clones, and even to this day new low-budget ones show up all the time. 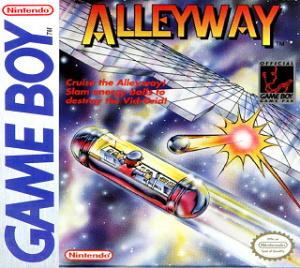 Even Nintendo tried their hand at a clone with Alleyway for the Game Boy. Alleyway keeps things to the bare basics. 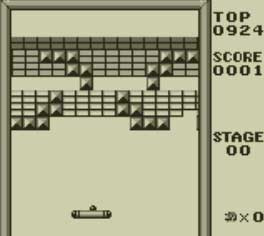 No power-ups or special, different blocks — all you do here is bounce the ball with your paddle in an attempt to break all the blocks on the screen. The only additional form of challenge rears its head if you take too long in beating a stage, causing blocks to descend after the ball hits your paddle a certain amount of times. After every three regular stages, you'll get a breather as you're presented with a bonus stage, where the ball will automatically go through all blocks instead of bouncing off, and there's no penalty if you don't clear all blocks or lose the ball — you'll simply go to the next regular stage without a point bonus. The most interesting thing Alleyway has to offer is the fact that there's a heavy dose of Mario cameos in the game. If you pay attention when starting the game, you'll actually see that Mario himself jumps into the paddle and pilots it, and many of the bonus stages are shaped like Mario characters, such as Mario himself, Bowser, and a Goomba. Aside from the Mario cameos, though, Alleyway has almost nothing to offer over Arkanoid and even some of its other clones. There's only 24 stages total, which never introduce anything new, and after beating the game you'll just start over with slightly faster descending blocks. Visually the game is extremely basic, but the Mario formations in the bonus stages at least add a small amount of flair. There's really no music to speak of as the only things in the game that could be considered music play during the bonus stages and ending, and they're just five second loops. Every other piece of music in the game is a simple jingle that plays when you start a level or lose a ball. Aside from the Mario appearances, there's not much to say about Alleyway. At its best, it's simply Arkanoid without all the fluff, and if you grew up with it you might get a kick out of replaying it, but if you're looking for something substantial it's probably best to grab AlphaBounce on DSiWare or Arkanoid Plus! on WiiWare for some much more compelling block breaking. This game has an awesome box art, though. AlphaBounce is much better than this, indeed. At least it's fun to see Mario cameos. Meh, I expected this score. The tagline sums it all up. Best off just getting another version. Lol I almost bought this. Thanks for the warning. Yeeaaaah, I'm really not nostalgic enough for most GB games to buy them, regardless of price. The only exceptions are Super Mario Land 2 and the original Pokemon games, but I wouldn't buy those Gen1 Pokemons again. I'm much too attached now to the gameplay improvements that have occurred in the last couple of gens. But, SML2, come on over! I found the original cartridge somewhere for only $1, so this sounds pointless. It's true, most GB games are primitive junk. Paying any more than 50p for them seems pretty idiotic to me. This was the first game of those brick breaking games like this that I ever played so it holds a special place for me. I never did get it on the GB I played it at my brothers house back in 91 so I will be picking this one up when I get a 3DS. I just bought Alpha Bounce, and considering buying this one after seeing the short little video. But after your review, I think I'll stick to AlphaBounce. Thanks. Eh. I'll probably still get it for collective purposes. Wasn't this a launch title? I dunno, I really enjoy Alleyway. And at only $2.99, you can't really feel bad about losing the money. Then again, I was around when the game first came out, and I used to like playing brick-breaking games on the Atari (Circus Atari is still awesome fun), so maybe I'm in the minority. Sure, it's a simple game with a simple concept, but that's why I kind of like having it on my 3DS's menu; sometimes I just want to play something for a few minutes, and with the new save state feature of Virtual Console, I can even pick up where I left off and save my high score, unlike the GB original. A 3 is a little harsh considering it's a brick breaker pioneer. Yeah compared to Arkanoid, it deserves that score. But on it's own, it should be much higher! I love playing this game! 3 stars only is too harsh, this is a nice game, I really enjoy it! I actually like it. Its relaxing when I take a break at work. @18 Alleyway a brick breaker pioneer? 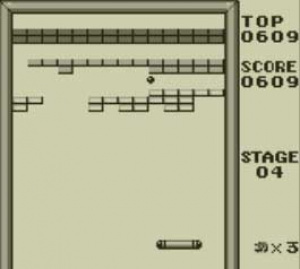 Sorry, even when it came out in 1989 it was boring and basic compared to the Arkanoid original from 1986 that was much better. If you want a great Nintendo Game Boy block breaker game I recommend Kirby's Block Ball. That one is spicing the block breaker genre with more fun and action. Anyway, thanks to Alleyway's new save/suspend feature this might be more bearable as in this form it's designed to be a little timewaster, nothing more - and 3 stars is fair. It's not mediocre, it just leaves much to desire. You will soon find much better clones on 3DSWare for the same price. I think this game should have been remade into 3D, so Nintendo could at least say "we made the first 3D block breaker game". It wouldn't make the game better but it would be easier to pay 3.99 for it, just because we Nintendo freaks buy everything Mario, even such a barebones clone as Alleyway. 3? That doesn't make ANY sense the way you reviewed it. It should be a 5 or 6. @21 Considering there's nobody else doing 3D right now really, and 3DSWare, I'm guessing Nintendo will still be able to say "we made the first 3D block breaker game." Haha! Though not entirely sure why anyone would brag/care about that. Read this review earlier and I still have to say I'm sort of on the fence. It's slim picking right now on 3DS VC. Of course, I have Link's Awakening... And since I didn't have a DSi, I'm getting a lot of interesting DSiWare as well. This was one of my most disappointing GB purchases back in the day. If they'd just added some good music to this game to give it some life it might have been worth playing, but it's just so stale and lifeless. Link's Awakening was worth 6 to me. And Mario Land...well, 4 was a bit much, but I bought it since I never owned the original. But yeah--I'm avoiding GB VC for the most part. Hopefully most will be 3, not 4 dollars. This isn't an Arkanoid clone. A 3! Oooh, that's low! It's just Alleyway.. nothing else to it, honestly. It's a classic game with not much of a purpose to it. I guess fans of it would get it, but not me. Not much of a fan of the type of game myself. It would be way better with power-ups, they add alot to the game. I can just stick with the Brick Breaker on my Blackberry. That seems alot more fun than this. @yoyogamer: Yeah, it was. That, and Radar Mission. Which I think didn't get much of a score either. Yeah, I do agree with 22. For the price it is, and for people who like this type of game, it should be a higher score than a 3. A 3? to to LOW! it shouid be an 8/10! I don't know why everyone is sh*tting on this game. It's simple, because it's meant to be simple. I really don't care if it's a ripoff of Araknoid or any other similar game. I think it's fun...go figure.